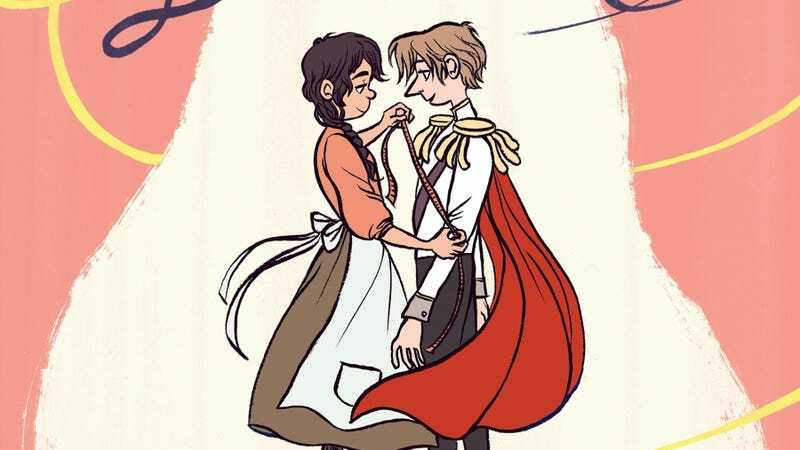 Fables are a reflection of the society they are created in, and with her new graphic novel, The Prince And The Dressmaker, Jen Wang has crafted a tale that acknowledges gender fluidity and explores romantic love beyond the gender binary. Sebastian is a prince under increasing pressure as he grows up and gains new responsibilities, and he has one outlet for relief: dressing up as a woman. It’s his greatest joy and deepest shame, and Frances, his seamstress, is the only person who understands his struggle. Wang builds a beautifully tender relationship between Sebastian and Frances, and this exclusive preview of The Prince And The Dressmaker shows them as they’re just getting to know each other and opening up for the first time. Wang draws lush environments and breathtaking dresses in this book, but her greatest strength is in her character work. Each character has a memorable design and their emotions are broken down with total clarity in both their facial expressions and body language. This preview is one big conversation, and it highlights how Wang energizes dialogue with her sharp storytelling. Sebastian is in a pale blue robe for this conversation, and his clothing reflects his cold response to the world when he’s not embracing his feminine side. You can see him light up when he starts thinking about those days when he feels like a princess, and the lettering reinforces how the feminine takes over by having the word balloon cover the Spartan warrior in the statue Sebastian is holding. He’s an invigorated person when he puts on Frances’ bright orange dress, and the design choices Wang makes for Sebastian’s two articles of clothing shows how the costuming is deeply tied to his emotional state. This preview offers just a small taste of the gorgeous dresses Wang creates in these pages, but readers can be washed away in the cascade of fashion and feels by picking up The Prince And The Dressmaker on February 14.